With his hand trapped in the door of a speeding car, a man struggles to remain upright as he’s dragged along a deserted stretch of San Juan Road in Phoenix’s South Mountain Preserve. It’s the perfect place to drive a man to his grave—literally. Starting with a crime so gruesome even prowling coyotes keep their distance from the remains, a killer begins crisscrossing the Southwest on a spree of grisly murders. A hundred miles away, Ali Reynolds is grieving. The news-casting job she once delighted in is gone—and so is the philandering husband she loved and thought she knew. When a member of the family who gave Ali a generous scholarship decades earlier suddenly asks her for a meeting, Ali wonders what it can mean. Before she can satisfy her curiosity, though, Ali receives another startling call: a friend’s teenage daughter has disappeared. Ali offers to help. But in doing so, she unknowingly begins a quest that will reveal a deadly ring of secrets, at the center of which stand two undiscriminating killers. 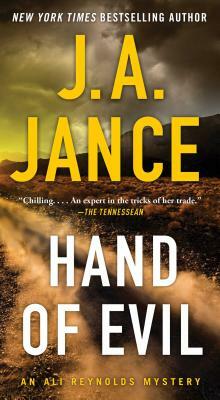 Hand of Evil is Jance at her best, weaving a masterful story of suspense that travels over generations, exposing two very different women with the same horrifying secret. Will Ali become a victim herself, or will she escape from a deadly deceit that no amount of security—financial or emotional—can cover up?